Captain Gene Coppinger (pictured left) has been employed with the Hamilton County Sheriff’s Office since September 1983. Capt. Coppinger began his career as a Corrections Officer and has advanced in rank from Corrections Officer to Sergeant, Lieutenant and to Captain. He is currently the Captain of Operations and oversees Shift and Security / Safety Operations, Training and Accreditation. Captain Coppinger has a Degree in Criminal Justice and Economics and holds Certifications in the American Jail Association as a Certified Jail Manager, Southeast Leadership Academy, Electronic Restraint Equipment-TASER, and Instructor on Gang and Security Threat Group. He is a member of the American Jail Association, American Corrections Association, Tennessee Gang Investigators Association, Mid-Atlantic Region Gang Investigator Network and the National Alliance Gang Investigator Association. 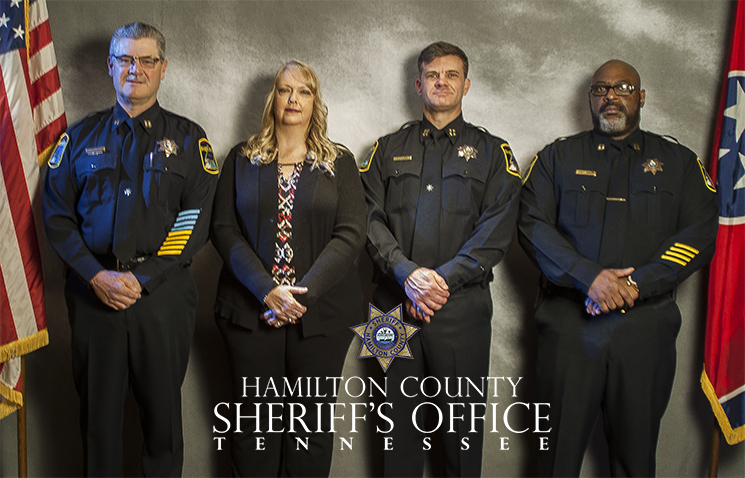 Denise Benton (center) has been employed with the Hamilton County Sheriff’s Office since June 2015. Mrs. Benton is the Administrative Assistant to Deputy Chief Fowler, Deputy Chief of Corrections. Mrs. Benton has an Associate’s Degree in Ministry and a Bachelor’s Degree in Christian Counseling. She resides with David, her husband of 13 years in Soddy Daisy, Tn. Together they have 5 children; Hannah, Brittany, Jacob, Logan and Ryan. Deputy Chief Fowler (pictured right) is the current Deputy Chief of Corrections and has been since November 2013. The Corrections Division consists of 158 full time uniform and non-uniform and five part-time personnel. The Hamilton County Jail has a rated capacity of 505 beds and staff booked 19,713 people in 2016. Deputy Chief Fowler served almost 23 years in the Army with most of those years in military corrections and detainee operations. He retired as a Sergeant Major, the highest enlisted rank. He married his wife Lisa in 2002. Along with their two children Joseph and Rayne, they live in Ooltewah, Tennessee. He earned a BA in Psychology, BS in Health and Wellness, a MA in Leadership Studies, and is currently working in a Ph.D. in Criminal Justice, Public Leadership and Management program. He is a Certified Jail Manager from the American Jail Association and a Certified Corrections Executive from the American Correctional Association.